Lethe are an unusual project with some well-known members: Tor-Helge ‘Cernunnos’ Skei (music and lyrics, bass and guitars, programming and synth, production), known from e.g. Manes / Manii, Atrox or Norwegian Suffocation, and Nucleus Torn / Eluveitie’s Anna Murphy (music and lyrics, vocals, bass, programming, piano, production and mix). They both combine ideas and inspirations from different musical angles, and canalise it into a personal (and this goes as well, for sure, for the lyrical part of the concept!) yet very unusual and experimental aural form of Art. On this album, they work with session guitar player Eivind Fjøseide, as well as different guests, such as Nicklas ‘Kvarforth’ Olsson (you know, the guy behind bands like Shining, Skitliv, Den Saakaldte, Diabolicum e.a. ), or several former or session Manes-members, amongst others. When Dreams Become Nightmares lasts for fifty five minutes and brings an experimental form of Music, constructed from a darker side of the musical spectrum, and drawing influences from different angles. The bio mentions things like ‘melancholic and ethereal, dark and enchanting, powerful and introspective’, ‘genre-binding, style-bastardization, eclectic, and even just weird’, or ‘something unique, something personal and quite different’… I guess it hits the bull’s eye, for these descriptions indeed do characterise Lethe’s mostly original and apart sonic creativity. It is almost impossible to put this project into a specific category, for it combines elements from Gothic and Dark Metal, Ambient, Pop-Art, Groove, Alternative Rock, Electronics and Trip-Hop, and much more than that. It’s renewing and innovative, experimental yet trusted, organic and anti-organised, expressive and surrealistic, and both uncompromising and open-minded too. Another thing the bio mentions is the comparison, via a ‘sophisticated sound’, with Ulver, The Gathering and The Third And The Mortal. I can agree for the better part with this, but I guess there’s much more. …In The Woods, Katatonia, Portishead, Germ, Dperd, Autumn, Orbital, Arcturus and, of course, Manes (post-Under Ein Blodraud Maane-era), might have been of influence as well. 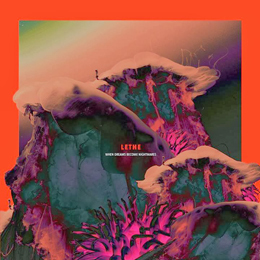 But whatever you want to call it, or you want to compare it with; Lethe are an own identity, an exceptional self-identified aural combo with a very specific self-created approach.